Great Birthday Party Craft, Activity and Party Favor! Super fun and easy for birthday parties, slumber parties or just for summer fun. Girls of all ages love them … kids, tweens or teens! They are easy and inexpensive to make. The perfect summer craft and party favor rolled into one. Pick up cheap flipflops at the dollar store or discount store. Use fabric scraps or inexpensive bandanas for the fabric. Use fabric that matches the theme of your birthday party. Fabric, fabric scraps, bandanas and even t-shirts will work. Cut fabric into strips approximately 1" wide x 6" long. You will need about 30 - 35 fabric strips per flip flop ... 70 for the pair. It is best to have these cut out before the party starts. Ribbon can be used also with or without the fabric. Cut ribbon into 6" lengths as well. Place a fabric strip underneath the top part of the flip flop and bring the two edges together so they are even. 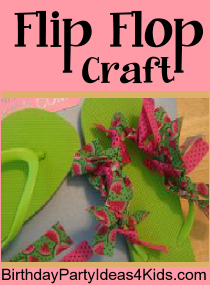 Tie the fabric onto the top of the flip flops and then knot it one time. 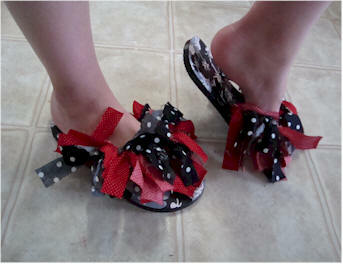 Flip Flop Craft - watermelon print fabric / pink ribbon with black polka dots. Tug the strips so the two pieces fall forward - toward the front of the flip flop. Alternate fabric colors. Repeat until the entire top of the flip - flops are covered. Use fabric and ribbon to match school colors or your favorite outfit. Instead of fabric use boa feathers wrapped around the top of the flip flop. Or hot glue colorful pompom balls on the flip flops. Choose colors from your party theme to tie the party together.